I had an awesome time hunting vintage lenses the other day! First off, I got to hang with my new friend Yensel at some sweet camera shops in ATL. Yensel is a Minister from Honduras that my sisters worked with during their time spent on missions. He is currently attending Seminary in Texas and Got to spend his last few days of summer with us here in Monroe @olivestudios. He is a film maker and Media guy so I figured I would take him out and show him our local shops. Our first stop was @showcasephotovideo. We played for a hour or so with a bunch of new gear like the Canon C-100, which my favorite homie @robadamsfilms just switched over to! We also got to fool around with the Panisonic GH4 and even see its 4K action on a large 4K tv! After drooling over gear and lenses we couldn't afford it was off to my favorite shop in ATL, @wingscamera. Mike over at Wings is just a killer dude with a heart for film cameras and vintage lenses. I get crazy deals on old camera bags, lights and lenses and am completely addicted! I totally scored @wingscamera and ended up buying three new (old) lenses and last but not least, Yensel and I meet @charlesstanley (who turns out is a killer photographer) at the camera shop and got to chat ministry and cameras! The day was finished off with a 4 piece tender meal from the Chick-fil-a so all-in-all I would say it was a killer day! 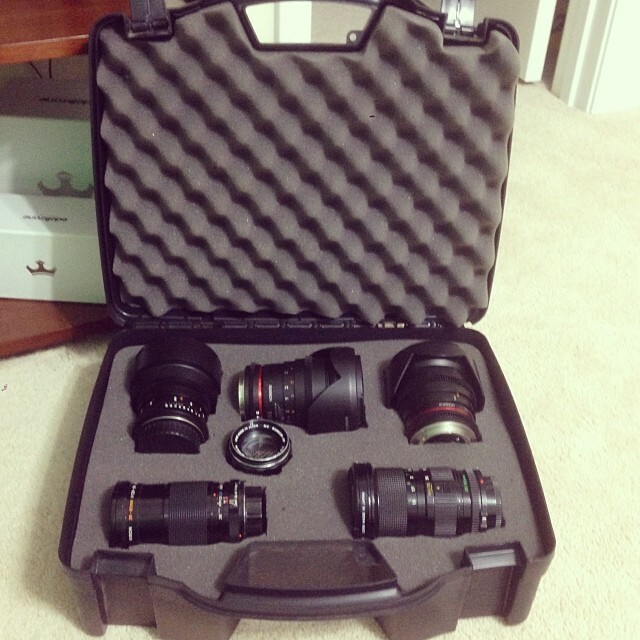 Inspired by my day and newly acquired legacy lenses I built a DIY lens case just to make them look pretty sitting there! Here are some cool pics! Enjoy!